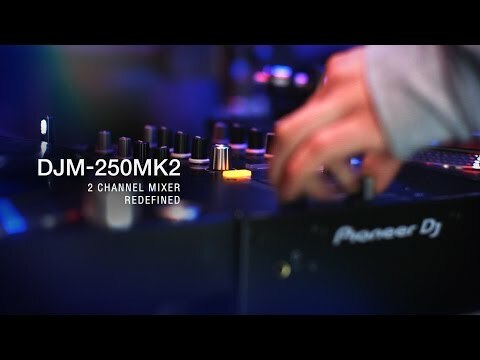 The Pioneer DJM-250MK2 2-Channel DJ Mixer builds on its predecessors capabilities by adding precision magvel faders allowing for complex scratching techniques, a powerful built in USB card for instantly recording your mixes to your computers hard drive and also comes bundled with Rekordbox DJ and DVS! Whatever your style, the Pioneer DJM-250MK2 is the mixer for you. A feature usually only found on high-end mixers, the performance quality filters on the Pioneer DJM-250MK2 Mixer have been taken straight from Pioneers DJM-900 Nexus. This gives each of the two channels an independent filter to allow you to marry tracks together perfectly with the aid of EQ effects to really smooth things out. Both of the sound colour filters are lit on/off to indicate whether it is in use or not to provide visual feedback in dimly lit environments, perfect for club DJ's. In addition to this is the 3-Band EQ/Isolation capability which is ideal for balancing out tracks that may not sit together in a mix or to simply cut and emphasize certain frequency related features of a track. Although compact in size the Pioneer DJM-250MK2 Mixer uses the same layout of mixers that are higher up in the range. Compact it may be but this DJ mixer really packs a punch when it comes to connectivity with a total of eight inputs. These allow you to hook up a whole arsenal of equipment, from MP3 players to synths. It can even act as a pre-amp. Connections included are: 1 MIC input, four DJ multi-player and analogue turntable paths, AUX and USB. With the Pioneer DJM-250MK2, whatever your existing setup, you can be sure of excellent integration. The Pioneer DJM-250MK2 also comes complete with high quality, balanced XLR outputs to provide crystal clear audio with no degradation and the ability to hook up powered speakers or other XLR devices adapter-free which is a huge benefit for club DJ's. If you require a fully featured, high-end audio experience but in a compact package, the Pioneer DJM-250MK2 2-Channel DJ Mixer will not disappoint and ensure you get the best out of your set for years to come.